It is Maja Gräddnos birthday and there is going to be a party. What she wants most of all is a herring cake from Biffens Delicatessen, a cake with lots of cream. And that's exactly what Pelle No-Tail is going to get for her, but once again Måns, Bill and Bull put a spoke in the wheel. But as usual they end up with the short straw. When it is Pelle's birthday and he is having a party the other cats ask if he is actually going to invite Måns who almost ruined Maja's party. 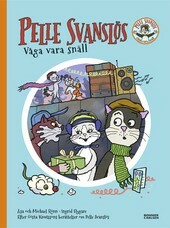 Then Pelle says: it's sometimes more difficult to be nice than stupid. But I dare to be nice.